No family/friends and none of 1,500 people receiving my publishing email was “able” to read and understand, which would only have required from 10 minutes to 1-2 hours per week to do! I was up against the incredible strong and WRONG feelings and voice of people, who did not need to read to WRONGLY believe that “Stig has lost his mind” and “Stig is offending everyone”! I was dying and almost desperate when asking people to READ and UNDERSTAND, but people had had “enough of me”, it was “simply impossible” for them to read – even when I was dying! I wrote the truth of the wrong doings of people VERY directly, which brought out the absolutely worst in some people selfishly thinking of themselves without understanding the Big Picture. People would gladly had accepted to be included in my scripts if they had only understood the big and positive picture, but the simple minds of people prolonged my pain. If people only had followed my encouragements to read and understand, they would easily have been able to understand (! ), but when they “could” not, they kept on bringing more sufferings. Despite of being my normal positive self when people met me, people believed that I HAD to be evil because of what they believed were my “extremely negative” writings on them. My family/friends etc. did not realize that they were the EVIL killing me because of their wrong doings, because ”surely we cannot be evil, when we only mean good”, but you were the Devil in disguise! Extreme feelings of my sister drove her to do her best trying to remove my “negative” writings on her using the police and our doctor as her weapons bringing me much fear and sufferings. My sister tried to remove my writings behind my back when contacting Microsoft, which partly succeeded; this is how close she came to eliminate my “life work” and the world! I was living in constant fear that family/friends etc. would try to remove my writings from the Internet because of misunderstandings and uncontrollable, negative feelings. Almost everyone was not “able” to read and understand, which brought me tremendous disappointment and sufferings and soaked out all energy of me. In the end no one could remove my writings from the Internet (!) and my family could also not hospitalise me despite of their belief that I was crazy. I have an unconditional love for my sister sharing the love of God with her – she was as important for our survival as I.
I needed love and understanding from family/friends more than ever, but their misunderstandings and fear made them abandon me and behave wrongly making me INCREDIBLY sad. I was left to bleed to death by my own family/friends and even when they knew I was fighting for my life, they “could” not read and understand me in order to help and support me! I was left totally alone without human support, money and food with the task to save the world still receiving the worst sufferings and fearing with “cold sweat” that the world would end “now”. When people “could” not understand me, they spoke wrongly about me behind my back sharing their misunderstandings and angriness/sadness making me a “laughing stock”. It was “completely unthinkable” for people to read my “rubbish” (!) and I was made a fool and a lunatic for telling the truth as I received it. After reconnecting with the Source in the summer of 2010, I was “not living” and desperately needed healing from family/friends, who all had abandoned me, which made me “throw up”. I met emotionally effected family/friends showing me concerns of my well-being and “wet eyes” hurting me much because it was ALL made up inside of your minds! In practise it was difficult, impossible or very painful to speak about my true inner self and important work making me mostly speak to family about my dull, superficial everyday also hurting me much. 4 of 10 family/friends said in 2010 that they would see me again, but in practise EVERYONE BUT ONE – in periods or all of the time – could not “bear” to see me again! “Friends” on Facebook simply decided to leave me as friends without informing me when they had had enough of my “crazy” postings of new scripts making me VERY sad whenever this happened. When I published my book no. 1 and 2 in February 2010 of approx. 1,500 pages and started writing and publishing my scripts of book no. 3 on my new opened website, I believed and hoped that – in first hand my family and friends but also several others of the approx. 1,500 people of the media, politicians, NGO’s etc. all over the world, which I sent my publishing email to (!) – would start to read and follow me, which is what I would have decided to do myself in their situation both because I would NEVER give up on a family member without doing my absolutely best to understand OBJECTIVELY (!) and also because I have always had high credibility among many people, which I thought would be enough for people to decide to read and understand me, but I could simply not imagine and had no idea of just how formidable my “enemy” of the darkness was, which is what brought people the wrong feelings of being better knowing about me without knowing, being lazy, ignorant, hyper sensitive and negative to take some of the feelings they received. From February 2010 and forwards I wrote an average of 100 to 150 new pages per month, or 25 to 35 pages per week, which would have taken most people 1-2 hours per week to read and only 10-20 minutes (!) if they decided to read only the summaries I had decided to do for every single script to help “lazy” people to understand (! ), but I quickly discovered that “my incredibly long writings” (!) in the minds of people were “far too much” and “mentally impossible” for most people to read (!) making people decide to not read or “skim” my writings only – a few times or “some times” by most people – after seeing each new script posted via a link on my Facebook site and “of course” it was “simply impossible” to read everything I wrote – “you write very many pages” as my mother’s husband John told me in 2011 after he had decided not to read any more after a long period where he had decided not to read my dreams (! ), where much “faith” lies, if you only read and understand, and this comes from a man, who has always read MANY books without problems (! ), also in English, which you know is the same for many other people – and this is what I was up against: My own family and friends did not have the “time” nor the “interest” to read my scripts carefully, but they had plenty of time to relax, to be lazy in front of the TV, to read “exciting” books such as “the Da Vinci Code” , which my book apparently was not in their mind (!) and to do everything else but to read my scripts carefully! I had written a story, which should be “pretty easy” for most people to understand – just like my LTO friends in Kenya had understood me and who I am “pretty easily” in 2009 – but NO ONE of the 1,500 people on my email list nor family/friends etc. in this “rich world” had what it took to read and understand, which was both a very surprising and really terrifying learning experience of mine. I wrote directly on my website and told my family over and over again that it is a condition to read CAREFULLY in order to understand – as Meshack as example continued to do in Kenya even when he could not afford to go to the Internet Café to read (!) – but despite of my encouragements, family and friends decided to only skim some of my writings, if they decided to follow me at all because I lost most of them on the way, and what I was up against was their incredibly strong voice telling them that I wrote negatively on people/themselves without understanding the “pretty easy” to understand truth that I was writing positively and this was really showing their WRONG ATTITUDE not to do their best to read and understand, which people did not “need” to do to be absolutely convinced that “Stig has lost his mind” and “Stig is offending everyone”, and the only people who had lost their minds were all of these people meeting me with their WRONG attitude, which you know is the insignia of the Devil, which they “could” not “shake” off them! The strong voice of people including their uncontrollable feelings of angriness/sadness made them give up on me! I remember when I tried to speak to my old “best friend” Jack about my spiritual experiences, when the community was not understanding me (!) and had locked me up on mental hospital in 2008, that he “switched on” the look that “this sounds crazy to me” at the same time as switching off his “hearing device”, which made it impossible for me to speak about my deep, inner self making me tremendously sad, but when I spoke about everything else, which in comparison was totally without importance and not what mattered to me (! ), we spoke completely normal as always, and it is really to say that it was not me being crazy, but people around me who simply could not listen to and understand the truth as I tried to explain to them – and I had the same experiences when speaking to my mother/John and very few friends including Fuggi, Paul and Lotus and also Pastor Leif from Lyngby Church, which is that it was impossible because of different reasons to speak about what was inside of me simply because of their strong voices setting the agenda and discolouring the truth. I was left alone without anyone being “able” to simply listen and understand, which is also why it was necessary to write down all of my scripts because one way or another my messages had to come through and Facebook was not the least important tool despite of the superficiality of this medium. The only family and friends – besides from LTO in Kenya – who followed me all along almost reading every script – however not necessarily word by word, thus not understanding all – was my aunt, Inge, and my old friend John (“Fuggi”). It did (almost) not matter that I again and again in my scripts and Facebook postings asked people to READ and UNDERSTAND and verbally to my closest family – except from my mother at one stage, who decided to follow my encouragement to read at least parts of my website and “some scripts” but for long periods, she did not read at all or “only what she wanted to read” where she “made up her mind” herself of what to believe or not to believe in strongly “supported” by the negative approach of my sister (my sister did not read much, she “gave” up very early, and did my father ever read one script (? ), I don’t believe so!) and at one point it became “simply impossible” for people to read because my continuous encouragements started having the opposite effect. It was “impolite” of me to tell them what to do! I was almost desperate when I was dying and people still could not read me objectively word by word to understand – which was not too much to ask (?) – but the more I asked people to read, the more people turned their backs on me including my sister, who at one point “had enough” of me and my “negativity”, which is what she thought, thus deciding not to read at all (! ), and when you don’t read, it is impossible to understand, but still people continued to have very “strong voices” and “opinions” about me, but you know eventually during 2011, even my small postings on Facebook including the headlines only (!) of my scripts and not least my new postings on www.scribd.com started to open up the eyes of family/friends etc. including my sister, but “how difficult is it for people to admit their mistakes when they have been so strongly against me influencing “many” about me” (?) and “almost impossible” is the answer, which then is the story of my sister. I decided from the beginning not to be afraid thus writing my scripts in a very direct language to “wake people up”, to make people clearly understand when they had done WRONG and what they should do to improve – but also as clearly when they did good, which however was far too seldom (!) – and I saw how people only skimmed the surface of my writings focusing selfishly on themselves as almost everyone did when they were only searching for and reading about their own name or company with some people getting “uncontrollable” tempers and VERY strong negative feelings almost wishing me dead (!) for what I had written about them because “he is destroying me” (! ), which you can ask my sister and several others about, and these were the kind of WORST feelings of all, which was led directly to me as extreme sufferings layer upon layer upon layer …., and it made me immensely sad to see selfish people focusing on themselves negatively misunderstanding instead of positively/objectively trying to understand the big picture and I saw it MANY times every single time making me incredibly sad. Was this really people of today, and yes this is what I saw to my surprise! The truth is that they would gladly have accepted my scripts telling the truths on them and consequently on mankind as teachings to the world if they had understood the “big picture” – the underlying positivity and wish to save/help the world – and also my “impossible” situation taking on “impossible sufferings” corresponding to the accumulated sufferings of ALL of their misunderstood sufferings and uncontrollable feelings, but when they did not, it was the Devil winning for a long time prolonging my pain merely because of narrow views of the simple minds of people – “what do you know about this world anyway”? If people simply had decided to follow my encouragements to decide reading CAREFULLY in order to understand instead of misunderstand, they would easily have been able to understand all of my POSITIVE messages, the whole purpose of my scripts and who I am but extreme negative feelings and also fear of me (!) made it impossible, and besides from family and friends, as example this ALSO included the jobcentre of the Commune, who could not control their anger on me because of my “negativity” when I was writing “negatively” on them and their “activation project” at Brede Park (! ), which also included other “employers” such as Dahlberg and Falck thinking the same – how sad do misunderstandings make people and yes, VERY SAD (!) – and the “game” was to make people understand the truth about me surpassing what was “simply impossible” for them to do – eeeehhh, to read and understand (?) as the remaining part of the Devil here asks me and yes “you bet” (!) – and for me to be strong enough to take on unbearable sufferings without breaking down, which also is given as the example to tell the world that you do believe you are able to communicate and understand, but MOST PEOPLE of today are not because of their own selfishness and strong voice making up their own minds often without listening and without true considerations to the truth (! ), which is one of the worst “diseases” of the world today. People wrongly thought I was mean and negative because of my writings – they could not understand the content, and reacted negatively to my “tone” (!) – and at the same time I was still my normal self when people met me speaking objectively/positively and laughing as I have always done – despite of the extreme negativity and sexual sufferings of the Devil ripping me up from the inside – and “how is it possible for such a positive man to be so evil” (?) and yes the conclusion of narrow minded and misunderstanding people “obviously” had to be that “he must be crazy” and “these are his inner demons” because what else could it be, because surely he cannot be speaking the truth about who he is? People did not understand the simple truth that I wrote the direct truth about their wrong doings, which was “totally unacceptable” and “extremely rude” of me to do (!) and then it was me – and not them – who acted wrongly (!) and in the first place they should have shown good behaviour for example as what Meshack did all along making me write positively about him all along (! ), and they did also not understand that any “errors” I may have made included in my writings was spiritual voices given to me returning some of the extreme sufferings, which they themselves – without understanding it (!) – had given me, and this was given to them because of the Universal rule that what you give is what you receive. My family/friends etc. did not realize they were the EVIL killing me because of their wrong doings – ”surely we cannot be evil, when we only mean good”, but you were the Devil in disguise! My “negative behaviour” was “completely unacceptable” to my family/friends etc. – again despite of being the same positive man as ever when and if they saw me (!) – and they did not understand that they were the EVIL themselves – the roles were reversed, do you see (?) – when they opposed me, behaved wrongly and misunderstood me for “surely we cannot be evil, when we only mean good” (!) but yes, even people meaning “only good” can be VERY evil indeed when they misunderstand and behave wrongly (!) because it is IMPOSSIBLE TO HELP IF YOU CANNOT UNDERSTAND (!!!) and this goes out to my mother being negatively influenced by my “we don’t understand but we know better” family because of course you only meant the best for me, but your misunderstandings and wrong behaviour were the weapons of the darkness killing me for years (! ), which of course was “totally impossible” for you to understand when you did not show the right attitude to understand with your strong voices deceiving you! The harder or more desperate that my family/friends etc. tried to make me understand their misunderstandings, the more they were killing me, and “you don’t hear/understand what we tell you at all” was a typical comment by my mother, Elijah etc. to me (!) but yes I clearly understood everything you said as I told you, and again the roles were reversed and as unreasonable as you can imagine when it truly was you, who could not understand me simply because of your own wrong attitude, laziness, poor work and “inability” to listen and understand, do you now understand or do I have to tell you again? When I was thinking of the sufferings I received from family/friends etc., it also made the Devil put on very much pressure to receive “revenge”, which was THOUSANDS of times; they had to die or suffer because of what they did to me, but no, I decided that I only wanted “good” for them and “light” to be sent to them and I had to decide for this thousands of times when being down on my knees because of them, where it would only have taken once to send them death and destruction. This was the difference. My sister WAS the Source of the darkness (!) as I have written about in a script until this source of darkness was disconnected after the Easter of 2011 – and this is despite of her attitude to “help” people and here I would like to say that my sister always only wanted the best for me despite of her misunderstandings and I love her as much as I know she loves me, which is much “more than I can say” – and for her it was COMPLETELY impossible to accept my “extremely negative” writings on her because of her priority of her work and “network”, which in practise was the most important to her and when I published my writings, I was not only making her “very sad”, which always “dissolved” her because of her love to me, I was also “destroying her”, which was the feeling given to her more than anything and this is what would drive the darkness through her trying its best to remove my “negative writings” without knowing that this would destroy me and the world (! ), do you see now? So when she “discovered” my writings on her in February 2010, she decided that she would protect her own selfish and wrong lifestyle given to her by the darkness without understanding the truth and big picture of my writings (!) thus not caring about removing “everything” else that I had written and when you believe that you cannot talk “sense” to a man – she asked me to remove my writings in a short email of the 3rd February 2010 saying “jeg må bede dig om at fjerne de private forhold og ting i forhold til familien du offentligører på facebook og på nettet og de link du har lagt ud” (“I have to ask you to remove the private information in relation to the family, which you publish on Facebook and the Internet, and the links you bring”), which of course did not have any effect on me – the only thing she could do was as she did, which was to contact both the police to ask me to remove my writings (!) and our old “family doctor” to help me back on the mental hospital (!) – of course only to “help me” get rid of my “crazy voices” (!) – and this is why I received two calls from the friendly police and equally as friendly family doctor in February 2010 trying to “help”, and I was happy that both the police and the doctor decided to believe that “nothing” was wrong with me – because I had completely “normal” conversations with them (!) – removing this “fear” from me, which is what it brought very much to me at the time, which I however kept having for many months because I never knew where I had my sister and what she would do behind my back also thinking that she could have decided to file a lawsuit against her own brother trying this way to remove my writings. Later when my sister reached the conclusion that “there is nothing I can do to make Stig remove his writings”, she and her own family decided to contact the previous host of my website, Microsoft, without my knowledge and of course without informing me (! ), asking them to remove my “life work” of writings (!!! ), which led Microsoft to close down my electronic library with hundreds of files (!) without Microsoft hearing or informing me of their action at all (!!!) – but no problem, I had backups and quickly found another library on the Internet – and I was “guilty” because this was the “easiest” and “safest” for Microsoft to decide on (!) but because of their “poor work” and a human error – made by the Devil too (!) – they “forgot” to remove my entire blog with all of my scripts (!!! ), which was the most important for me to preserve. This is how close my sister came to eliminate not only my “life work” but the world (!) driven by her strong voice, misunderstandings and ego trying her best to “survive” what she saw as my “attacks” on her and the family, but as you understand, the Devil cannot defeat me when I have decided that I will get rid of the darkness, and isn’t this funny, this is what we have believed in all along ourselves as I am told here and we know Stig, it is not from “strang(l)ers” that you have received the I WILL NEVER GIVE UP attitude and up here it is always the sun – a-ha, almost like the sun always shines on TV (?) and yes that’s right 🙂 – and this favourite music of mine symbolises “warm feelings”, which is ALSO to say just how much I love my sister and this is for you, Sanna, to understand and of course to understand objectively without using your feelings to deceive you as I have told you all along NOT to do (!) as you did anyway right from the beginning in 2008, when you did not listen to and follow me (!) when I “tested” you by giving you the script of my book no. 1 (!) and do you now understand just how easy it truly was to understand me, if you had decided to be OPEN and OBJECTIVE showing the right attitude to read my scripts word by word as you would do almost with everything else including tasks at your work and your management education (?) instead of believing in your own WRONG voice and feelings, which also made you very wrongly tell others about just how crazy I was, which people of course could not see themselves! Since my sister’s attempts to remove my “life work”, I was living in CONSTANT FEAR of (family), friends and ex-colleagues first to discover just how directly I had written on them, which some did also as needed to bring me darkness to absorb (! ), and then the risk that they would not be able to control their negative feelings and as a consequence decide to try removing my writings from the Internet by contacting my webhosts directly, who were likely to remove my writings “just like that” instead of having the “trouble” to have to listen to and follow me. This fear did not became better when my computer screen started dissolving in front of my eyes in the middle of 2010 as the symbol of our world – on the edge of – starting to dissolve (! ), when my keyboard stopped working and when the Internet, my website and computer programs started acting “strangely” – being spiritually influenced – as signs of people opposing me and wishing my “negativity” and “secrets” on them removed from the Internet when they decided to focus negatively on themselves instead of positively/objectively to understand the big picture. Except from my aunt Inge and partly my friend Fuggi, no one outside Kenya decided to follow my request to read carefully to understand – everyone else did not have to in order to understand that I was crazy, at least for a long time (!) – including all old friends and colleagues, who did not have what it took to read and understand (! ), and have you any idea of just how much disappointment and sufferings this brought me? All people who “loved me” and “only wanted the best for me” could not control their feelings of anger/sadness – I felt their anger coming to me and sometimes it was “uncontrollable anger” with people almost wishing me dead – and instead of helping me, they were killing me (! ), but as you know by now, this is what was required to bring the world in a state of “not existing” to reconnect with the Source and it was my own family/friends etc. – symbolising the world – who completely soaked out all energy of me. The darkness consumed all light, and when this happens, you should not be able to survive, but this was our only road for survival. After these attacks on me, my sister and eventually everyone else finally came to understand that there was absolutely nothing they could do to remove my writings from the Internet – I would upload them somewhere else if needed, which I informed about in my scripts, which no one could stop (!) – and she could not hospitalise me either because I had shown her and the family that I was in control of the law and the system, which was “strange” to you wasn’t it, because obviously I had to be “crazy” – even though I behaved as a normal man when meeting you (!) – and still it was “impossible” for you to get me hospitalised – and I am here thinking of you also contacting doctors at the mental hospital and also employees of the Jobcentre in the Commune behind my back, and of course “only to help me” and I can only say NEVER DO ACTIONS LIKE THIS BEHIND THE BACKS OF PEOPLE, it is truly the worst you can do (! ), and always do your absolutely best to understand and not misunderstand and Sanna, let me tell you that I was truly not hurting you, it was your own misunderstandings hurting you, but you may like to know that your WRONG actions were “this close” to kill both our mother and me when your wrong actions brou9ht darkness and “life dangerous sicknesses” to us (! ), which would also have killed you and the entire world, and this is basically what I saved you from, do you see? My sister, Sanna, was “the worst” of all because of her immensely strong/wrong voice and stubbornness, but still she was as important as I to save the world because I needed my family actively bringing me darkness, which I “just” had to survive (! ), and this was the task of Sanna, which she did to “perfection” influencing the family against me because everyone could clearly see just how “terrible” I had been against her in my writings (!) – they did not know that the story was reversed and that she was killing me while she was living a life in luxury compared to mine – and this made her as much a hero as I – thank you, voice 🙂 – and this is what David Bowie’s song “HEROES” is about, so Sanna here is my favourite song of all songs – this is my TRUE love for you as my sister knowing that you have the same feelings about me and that is because I share the love of God with you even though we have different physical fathers. After publishing my scripts and opening my website in February 2010 I faced the period of my life when I needed the love and support of my family/friends more than ever with extreme sufferings via the worst negativity, sexual sufferings and lack of sleep brought to me – by my family/friends etc. (!) – but instead of offering me what I needed to survive, they abandoned me and behaved wrongly, which only worsened my sufferings to a point where I was not technically living. People could not “accept” my “claims” of who I am, my so called “negative writings”, they did not want to be associated with me as a “mad man” and they feared of what I would write about them if they were to see me again with Paul, who decided to see me once in 2010, as example directly asking me NOT to write about our meeting (!) – I was the “cancer” in their lives and they “could” not understand that it was the opposite situation with (almost) all of them being the cancer of my life because of their wrong behaviour. Preconceived opinions, misunderstandings and laziness to read and understand objectively made people decide to stop seeing me with most furthermore NOT informing me of their decision and not even answering emails when I asked for their friendship directly! They simply stopped seeing me, which René – one of my best old friends – was an example of. From one day to the next he changed from one of my best friends to a “stranger” without telling me – I did not hear from him again – which was not because of me but because of his own “compulsory thoughts” when fearing me. Do I have to tell you just how sad almost everyone made me? I saw the worst of you and all of your wrong actions was based on your own misunderstandings, which was truly NOT a pretty sight. I was left to bleed and still people did not really try to read and understand me or want to have anything to do with me, not even when the Commune WRONGLY removed my cash help in the middle of 2010 when they tried to remove my freedom of speech, which I would NOT accept. In the minds of people, I was “completely insane”, lost to the world in my own “mad world” and in this situation when even my mother – because of the pressure from the family – had abandoned me leaving me to die, I was truly NOT LIVING (!) 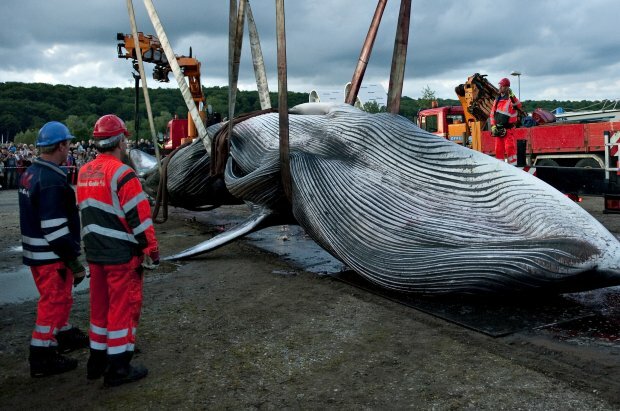 as the whale of Vejle Fjord in June 2010 was the symbol of when “careless” people decided not to do much/their best to save it – as my family/friends etc. in relation to me – and the whale died symbolising the end of the world if I had given up; if I had not be strong enough to keep on taking your sins on me as sufferings. My family/friends etc. kept on “watching me” fight for my life – as people had watched the whale fighting for its life – through my Facebook postings of new scripts telling about my starvation, but still nobody, not even in this situation fighting for my life, which should be visible for all (! ), had the “ability” to simply start to read and understand me, which would have made them bring me help and support, and this is even though it is not difficult to read and understand (? ), so this is how the whale died, but still I decided to stayin’ alive. I was left totally alone in the middle of 2010 without human contact/support, money and food with the task to save the world, which is NOT the easiest thing I have done in my life, but it was necessary to do it like this – if my mother had decided not to abandon me, the world would not have been “technically not living”, which is what was required and I was told at the time (!) – and I cannot tell you how immensely SAD people and my lonely situation made me but on the other hand, I have been lonely all of my life to come through this, which I did all by myself completely humiliated by people acting wrongly, and in order to understand my true sufferings, your job, my dear reader, is really to put all of my sufferings on top of each other because on top of this, I was physically breaking down of exhaustion, being constantly terrified of the darkness overpowering me, the constant feeling of FRIGHT in the air being forwarded to me and having “cold sweat” believing that the world would “now” terminate etc., which is what brings a “difficult situation” for a normal human being to bear. After reconnecting with the Source in the summer of 2010, I needed urgently the love of other people to heal me in order to survive, and I started seeing some of my family and a few friends again as you can read from below, but I was still in practise abandoned by most people still making me lonely all throughout 2011 too, which I however “pretty easily” could get over for a long period of time doomed to stay indoors constantly working, watching television in the evenings, constantly fighting darkness bringing me unbearable sufferings and then “sleeping” – over and over and over again – but it made me VERY sad when I at the same time could continue reading about family/friends on Facebook continuing to party, go on holiday, buy more luxury goods/clothes etc. – which my LTO friends and I could not – seamlessly living carefree lives not caring and at least not communicating with me, and this is the secret, because you “could” not communicate with me, but still many of you had “much love” to me – but you could not show it because you did not know what to do giving some of you “poor conscience” (?) and how many times did I ask you to read, understand and communicate (?) and just wondering I am. When I was thinking about just how wrongly people behaved in relation to me and just how selfish they have been without (thinking of) helping me, but in practise accepting me to die etc. I was constantly given the absolutely strongest voice trying to convince me “therefore I want them to suffer” or even “therefore I don’t want them to live in the future” and to the darkness – the voice given to me – this made perfectly sense except from one thing, which was that as Stig, the last bastion, I could not accept this to happen even when I was broken down because of darkness forced upon me by the same selfish people – you were killing me and I decided to save you all, this was it really. At the same time as I was left alone – most of 2010 and 2011 – with some periods where I mainly saw my mother/John and a few times also Sanna/Hans – I knew that people were speaking wrongly about me behind my back, not least my sister and mother being the worst of all with denials and “misunderstood hurt feelings” of my sister influencing my mother against me and my mother not understanding for a long time my “attacks” on both family, other people and the system of Lyngby-Taarbæk Commune, which is what almost brought my mother and I down! People were angry, sad and concerned about me having “lost my mind” and I was made a laughing stock and humiliated by people “guessing” and thinking the worst of me – “have you also heard the news about Stig”, “isn’t it sad that he has los his mind” and “who is Stig” etc. – and of course it was a “joke” that I – and others – spoke of the risk of the world going under, because OF COURSE this was totally impossible even to think of – at least for people without or only little faith – because how in the world should the world be able to go under when it is “just there” as it has “always” been (? ), which made people “shake their heads” in disbelief without understanding that this was the exact danger we were facing, and Piet – one of my old Facebook friends – and a few of his friends were examples of this when they laughed about a man in public warning of the world going under and also me when commenting on the truth of this on Piet’s Facebook wall with Piet believing that Disney was better to give predictions (!) and a friend of his would like to hear if what I was taking was available in the form of pills! People were ridiculing me convinced that they possessed the truth without even wanting to read and understand the real truth – they were possessed by the Devil! Some of my old friends and ex-colleagues may have started gossiping about my “made-up by themselves wrong doings” in the past to confirm my “craziness”, and I kept on trying to make my self understood at the same time as I knew that I continued to receive wrong spiritual messages – included in my scripts – because of their wrong doings and how could I make them understand this easy to understand truth, if they did not want to read my “crazy” scripts (? ), which of course was “completely unthinkable” to do for MANY people, which Tine from jobcentre at my Commune was an example of – why should she waste her time starting to read me to follow my encouragements when everyone could tell that it was “complete rubbish”, but eventually people may have started speculating that “just maybe there is some sort of connection in what Stig writes” because it is not “completely mad” what he writes for example on how to behave and work, which should be simple logic for everyone to understand. I decided to be public about my self and all of my life, which was required to do, and in the beginning it was “almost impossible” for me to publish scripts about myself knowing what my family and friends would think of me, which required an IMMENSE self-conquest to do also because I have NEVER liked to be public about myself and the darkness was doing its absolutely best for me not to be able to overcome this hindrance, which was in itself a “severe” hindrance to overcome, it made me throw up just thinking about what people wrongly were thinking of me because of my postings, but this was the way we had to go. My postings on Facebook was the mean to influence people without people knowing about it. For a long time, I was a “joke”, a “fool” or a “lunatic” totally outcast by family, friends, ex-colleagues, the Commune and Church and with no family/friends/girlfriend to support me – my “girlfriend” was led by darkness into the arms of other men as the curse of her life. People had abandoned me and my “crime” was simply to tell them the truth also bringing spiritual messages not knowing myself what was the truth and not, which in itself was an incredible suffering of mine because the truth means so much to me. After reconnecting with the Source in the summer of 2010, I was “not living” and consequently in EXTREME life danger with the need here and now to be together with people to receive healing from their loving and caring feelings towards me (!) and how do you think it made me feel that I had to contact family and friends asking them to see me again hoping that they would give me these “loving and caring” feelings instead of the opposite feelings with the risk of finishing me off (?) after they had wrongly deserted me bringing me the worst suffering any man has received because of their “inability” to understand (?) and yes it was the absolutely worst giving me throwing up feelings at the same time as I decided that I wanted to focus on their good sides and our old, good relations/friendships. With this background, I wrote to 45 people around the 1st August 2010 asking politely to see them again as family/friends with the main message that I was the same Stig as always with the result being – as you can see from the pole below – that approx. half did not even “care” to send me a reply (!) – we talk about “family/friends” (!) – and 38% sent me a “positive” reply, and in reality I started seeing some again – mainly my mother and John at least in periods and once or a few times also other family members and friends – and the love I received primarily from my mother is what brought me back to life again (!) but still all throughout 2010 and long periods of 2011 I was living critically on the edge of dying because of continuous negativity being sent to me and loneliness without receiving “healing energy” of other people when almost everyone in practise had difficulties to “bear” me to return as their family member/friends and also because of selfishness of people thinking on their own material “needs” without wanting to financially help me (or LTO) at all, and that is except from a little money from my mother now and again, which she often had to give me in “secrecy” because John did not like her to do so! The Verdict of family and friends: 2 out of 3 have abandoned me because of WRONG negative feelings! * A total of 7 family members and friends did not receive my email because they had already accepted me a few days before I sent the email. When I met people again, I could tell that their warm/loving feelings were intact as foundation but I also saw just how effected some people were when they could not stop their eyes from becoming wet because of their feelings and sadness – in their minds – about me! Their misunderstandings brought them EXTREME feelings – which they all gave to me as sufferings to “handle” – and when we met, I also had to listen to their simple misunderstandings and STRONG voices not believing in me, and this brought me very MUCH SUFFERING too and here for example thinking of you Paul, Kim S., Preben, Lotus and not least you, Fuggi, when I met you. I “had” to understand you, which I did, without anyone of you truly understanding me, and I can tell you that it hurts immensely to see family/friends etc. speak to me with a totally misunderstood and concerned voice and with wet eyes telling me to understand their misunderstandings and that “I do hope you are doing fine” – giving me all kind of “good but misunderstood advices” of what to do (!) – and my dear family/friends etc. : IT WAS ALL MADE UP IN YOUR OWN MINDS, none of you were STRONG enough to do what I encouraged you to do many times, which quite easily was to READ and UNDERSTAND me objectively! You could not defeat your own strong voices – I had to help you doing it by being stronger than all of you together! When I did see my family, it was difficult and mostly impossible to speak about my true life and experiences – and impossible when Sanna and Hans attended and my sister is a psychologist, isn’t this wonderful (?) – and except from trying to speak with my mother and John about this sometimes to make them understand, which was truly very difficult and a very deep emotional pain for all of us to do because of their misunderstood resistance, I was “forced” to speak about my depressing life with daily unimportant experiences with the Commune, Brede Park and Falck and sometimes when I spoke of the wrong-doings of the system, I did not even have my mother/family on my side, because “of course” the system and the law had to be right and “they are only trying to help you” (! ), but they did the opposite than helping (!!! ), which brought me even MORE SUFFERING just to speak about – because it was impossible to speak seriously about the content and importance of my true “life work”, which did not have much interest of people (!) – but gradually I did receive a better understanding from my mother also on this, but it was truly not an easy task to gradually understand that I was simply telling and writing about how to improve the system, work and behaviour of people. Obviously, one thing is what people answers in poles, and another thing is “reality”, because in September 2011, when this is written, I can give you an update saying that I saw my mother and John maybe half of the time from August 2010 until September 2011, my sister and her family only a few times because of my sister’s continuous “misunderstood hurt feelings”, my aunt Inge was the only one not opposing me at any time (! ), thank you Inge :-), I did not see my father at any time, I saw Kim S./Preben only once but in practise they also turned me down when they stopped seeing me “just like that”, the same as Paul did, Kirsten C. turned me down most of the time until she finally understood in the summer 2011 that I was exactly the same good friend as ever as I had told people in my emails around the 1st August (!) but it is difficult to “overpower” the strong sceptical and wrong voice of people (! ), I did not see Lisbeth, who never “came around” to see me as promised, and Pia/Peter decided to become negative instead of positive showing a sceptical attitude and focusing on ridiculous details as example of what several did including Fuggi, whom I saw until he also misunderstood me also abandoning me because of “ridiculous” details, I saw Lotus once, Pedro was “sceptical” almost losing contact with him and Elijah was against me much of the time before turning around in 2011. The conclusion is that in practise everyone but one (!) – my aunt – could not “bear” to see me at least in periods, which had nothing to do with me but only with the darkness working inside of them, which brought them away from me despite of the underlying love of all of these people, do you see? Since February 2010, I have also seen one “friend” after the other leaving me as friends on Facebook because I was “annoying” them much with my “crazy” postings of new scripts, maybe 15 or 20 percent of all and how many of the ones staying as my friends thought about doing the same without “getting around” to leave me in practise (? ), and every single time a “friend” left me – several times it was people who I believed to have deep friendships with (!) – it made me VERY sad, and everyone without exception “just” left me without informing me (! ), which is what normal friends would do in such a situation isn’t it (?) – as I did myself when I decided to leave my father in 2009 (!) – which of course is a situation you will not see again in the future. SAD is the word of what all of you made me and that is except from Inge! This website was first published November 12, 2011, and has since been updated few times.